The Streamers got off to the perfect start when Shane Bonnington capitalised on a mistake by home keeper Stuart Hall to fire the visitors into a fourth minute lead. The lead was only to last three minutes, however, with Lewis Elder restoring parity by firing a direct free kick under Elliot Turnbull to make it 1-1. The Blues were now starting to lose their shape under the Keir’s Park lights and fell behind in the 13th minute when a corner was only partially cleared and fell to the head of Ricky Patrick to nod the Haws into the lead. Worse was to follow in the 25th minute when ex-Hawick Royal Albert player Josh Morris crashed an unstoppable drive into the bottom corner from distance to increase the lead. Neither goal was threatened again before the break as Haws comfortably held their lead at the interval. Coldstream started brightly after the restart, Matt Corfield saw his strike from the edge of the area fly narrowly wide in the 46th minute but they couldn’t find a way back into the contest. Joe Kirby went close to giving Hill of Beath a tighter grip on the match after an hour but fired wide when well placed. Morris completed the scoring with his second in the 64th minute to make it 4-1. 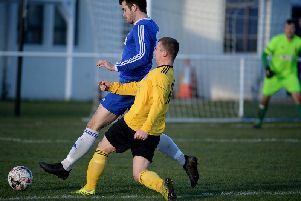 Coldstream deserved another goal for their efforts after a long trip for a midweek fixture but their luck was out as Bonnington’s angled drive crashed off the crossbar with time running out. Up next for the Streamer’s is a tough looking away fixture at Broxburn Athletic in the King Cup second round. Hill of Beath: Hall, Leishman, Kellichan, Conners, Wright, Patrick, Morris (Valente 85), Marshall (Nicoll 78), Watt (Watson 78), Elder, Kirby. Subs: Watson, Valente, Nicoll. Coldstream: Turnbull, Straughan, Herdman, Fox, Heugh, Dixon, Bright, Lee, Bonnington, Corfield (Gay 65), Paterson. Subs: Gay, Allan. ****** Coldstream points deduction: The Streamers were deducted three points for fielding an ineligible player in a 5-0 win against Peebles. We previously reported that Peebles were awarded the win - this is not the case and Coldstream have simply lost the points. Apologies for any confusion.